Danny O'Brien has fulfilled his brief with West Australian mare Miss Rose De Lago but believes there could be a group 1 bonus coming in the Myer Classic at Flemington on Saturday. Owner Barry McRostie sent Miss Rose De Lago to O'Brien in the winter with the instructions to get her rating up, so the daughter of Encosta De Lago could return home for its group 1 carnival. "She is a beautiful type of a mare, big and strong and we were just hoping she could win a couple of races over winter, which she did," O'Brien said. "The long-range dream was the Railway Stakes back in the west. Barry wanted to get her rating up to put her in a position to get into that. "She has probably surprised us in that she has gone past just doing that and got to the Myer [Classic] with a very good chance." Miss Rose De Lago, a natural front-runner, caught the eye after a short break when she sat three-deep and looked the winner in the Let's Elope Stakes before being swamped late and running fourth, only a half length from Amicus. "She is certainly better at a mile. Over the shorter trip they are a bit sharp for her at the end," O'Brien said. "As we got her out in trip in the winter she got better and I think she showed how effective she is at a mile last time. "Over the mile she can get them out of their [comfort] zones and really make them chase. She is a big, strong thing and runs a really strong mile and I think she will run 2000m one day. That is a real advantage in a race like this." O'Brien's instructions to rider Opie Bosson will be to let her roll, particularly with favourite Stay With Me and Azkadellia, an $8 hope, having the pattern of getting back. "If she sits up a bit they can outsprint her, so there will be no loafing on Saturday. 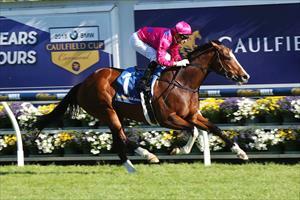 She is going to get rolling from the 800m and test them all out," O'Brien said. "The favourite is going to have [to be] a bloody good filly to give her a start and a beating." Win or lose on Saturday, Miss Rose De Lago has earned a trip for the Railway Stakes and the Kingston Town Stakes and with a touch of luck by the end of next month she could be a group 1 winner.